Oh boy....This one doesn't bounce at all, looked like some magnetic force from underneath the pitch pulled the red cherry. Pujara does well to get his bat down in time and defend. Anderson to continue, Prior has gone back now. Good delivery. Short of a good length delivery outside off, some extra bounce. Vijay is caught in two minds and he leaves it alone late. The ball flies inches past the outside edge. Three runs off the over..
Ah......A touch short from Anderson, Pujara pulls it and it hits Robson on the leg at forward short leg. That might have hurt. FOUR! Brilliant placement. Pujara stays back, waits and just guides it to third man for a boundary. Edgy, Full outside off, goes straight on. Pujara comes forward for a push but gets an outside edge wide of first slip for a couple. SIX! Audacious from Vijay, there is a long on in place but still, Vijay dances down the track and hemmers it over wide long on for a maximum. This time he uses his feet and cleverly pushes it to long on for a single. Yorker outside off, Vijay digs it safely. Good running, Vijay uses his feet and pushes it to point, they scamper through for a couple. 6 runs off the over. Easy singles on offer for the batsmen. Good length delivery on off, Vijay turns it to square leg for a single. Seems like England are having a problem with the ball. The umpire is OK with it through!!! On the pads, Vijay whips it to fine leg for a single. Vijay follows up his century in 1st inns with a fifty in the 2nd. He looks set for another big one.IND-123/1. 4 runs from the Moeen Ali over. Pujara cuts it wide of third man for a single. Just one run off the Moeen Ali over. FOUR! Crashed away. A bit of width provided, Pujara latches on to it and cuts it powerfully through point for a boundary. Pujara moves on to 48 now. Pujara brings up his 5th Test fifty with a thumping pull off Plunkett. IND-136/1, lead by 97 runs. Vijay dances down the track and flicks it uppishly to deep mid-wicket for a single. India lead by 100 now. OUT! Moeen Ali picks up his 2nd wkt of the inns. It's his 1st right-handed scalp as he has Vijay stumped. Vijay dances down the track and looks to heave but gets a slight edge and Prior makes no mistake. IND-140/2. OUT! Another one departs. 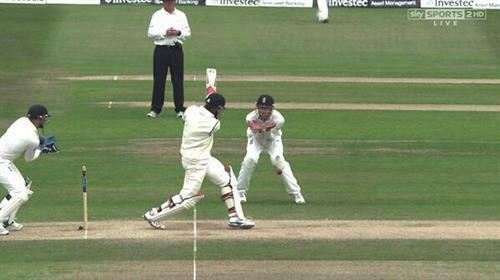 Width offered by Plunkett but Pujara hits it straight to point where Stokes fumbles but then dives and pouches it. Rahane is the new batsman who joins Kohli out in the middle. FOUR! Wristy stuff, Full on the pads, Rahane flicks it through mid-wicket for a boundary. Stokes replaces Moeen Ali now..
Short outside off, Rahane pulls it to deep mid-wicket for just a single. Short on off, Rahane ducks under it. Two runs off the over.